It's a party, and everyone's invited! The Gaming Table is perfect for family fun on a rainy day, or a Friday night with friends. Break out the drinks, snacks, music, and dice. With the Gaming Table, there's a game for everyone, all conveniently built into the table via pull-out drawers and a flipping center. The Gaming Table features something for everyone. Pull out the green felt board and chips and get a raucous game of poker going, or gather the family for a friendly game of Monopoly. Play backgammon, loaded dice, dominos, checkers, chess, or any number of tabletop games-it's a table full of excitement! Not in the mood for gaming? 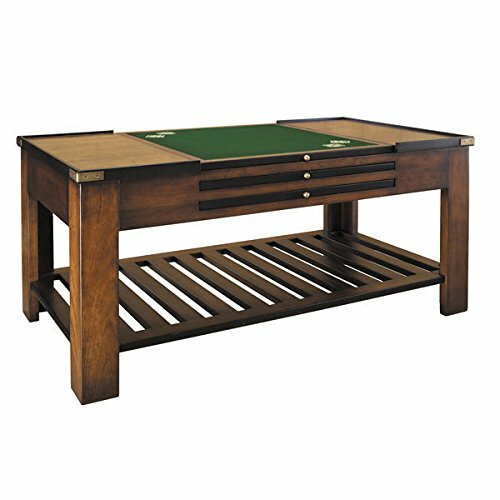 Flip the Gaming Table top over to display a beautiful cherry wood or classic leather surface. The table is built of cherry and birch, and stands 17.75" high, the perfect level for sitting on the floor or on the couch. A compartment for rule books and additional game boxes are included on the lower level. Its exceptional construction would be at home in a formal setting, yet fits equally well in a fun, casual setting. If you have any questions about this product by Authentic Models, contact us by completing and submitting the form below. If you are looking for a specif part number, please include it with your message.